All of the events in 2019 start in the village in Holmesfield. Whilst it’s a lovely place and has several nice pubs, it was also the home to one of the original champions of access to open land GHB Ward. Without GHB and those early pioneers we probably would not be able to run our events. George Herbert Bridges or GHB or Bert Ward was born in the middle of Sheffield in 1876. In 1900 he put an advert in the Clarion newspaper for a walk around the highest hill in Derbyshire Kinder Scout. Back in those days you could walk around the plateau but the summit was private land. On the back of this walk he formed the Sheffield Clarion Ramblers, the world’s first working class rambling club. This organisation became the chief organisation for campaigning for greater access in the Dark Peak. As early as 1907, 25 years before the famous mass trespass, they were organising walks across privately owned shooting moors. In 1923 Ward was served an injunction to prevent him setting foot on land on the western, Hayfield side of the Kinder plateau which would have prevented him taking part in the mass trespass 9 years later. Ward was also a Freemason. This may seem strange from a man who was a committed socialist. It however did give him access to some of the major local landowners. Federation of rambling clubs were starting to form in northern cities like Liverpool and Manchester. In 1926 GHB was instrumental in forming a federation of the 18 Sheffield Rambling clubs. A year later a meeting of all of the ramblers federations was held in Hope with the aim of forming a national body. In 1931 another meeting was held at Longshaw Lodge, which had recently been purchased from the Duke of Rutland using an early version of crowdfunding. This established the National Council of Ramblers Federations, which in 1935 became the Ramblers Association. In 1941 GHB retired to Storth Lodge on the edge of Holmesfield. Folks that entered the Brutal Tootle passed the entrance to this house. Without the pioneering work of GHB we probably would not have had the access to the uplands we do at the moment. Great advocacy work has been done locally to us by groups like Ride Sheffield and Peak District MTB, working with local landowners to improve access and help them maintain local trails. The short MTB route below passes GHB Ward’s house and takes in several concessionary bridleways across the Eastern Moors Estate. This is another route which is a fave of ours and part of it is the commute we do into Velotastic HQ. It starts and finishes at Chesterfield railway station, so there’s no excuse to drive to the start. The route heads off down the Chesterfield canal which is a nice traffic free way out of the town. After a few miles there is a short climb through the village of Whittington followed by a bridleway to the quiet village of Hundall. On a good day there’s a panoramic view over to the Peak and down the Drone valley. From here it’s onto Apperknowle and down a bridleway that’s just beyond the Travellers Rest pub. The trail goes round the back of an airstrip. It’s rarely used, so if you do see a plane it’s a bonus. Then it’s a short road section through Troway. Next is a fun descent down into the Moss Valley which is followed by an inevitable climb. Using a set of bridleways the route traverses the valley onto Mosborough. Then it’s more downhill to Eckington and off road to Barrow Hill. From here we rejoin the canal and take the Transpennine Trail towards Inkersall. Then it’s a fun descent through Westwood and onto Brimington Common. The ride returns to the start following the Transpennine Trail across Tapton golf course. The route takes 2-3 hours so is an ideal Sunday morning or weekday evening ride. There’s plenty of places (pubs) on route to get a drink. If you like this why not check out our events ? One of the most useless pieces of trivia about Chesterfield are that the hills to the edge of it are the highest point on that latitude to the west of the Urals in Russia. The other factoid is that, on a good clear day, you can see Lincoln cathedral’s towers from the top of them. There also used to be a railway between Lincoln and Chesterfield. Back in the Victorian era there was an ambitious plan to build a railway from Lincolnshire to Lancashire. All was going well until they reached Chesterfield and realised that things were going to get both tricky and expensive to cross the Peak so the plan was abandoned. Part of this route follows this line across a disused railway viaduct over the Trent. The route starts by Chesterfield railway station and follows the canal for a while. From here it goes up the Clowne Branch Line which is a fantastic newly created shared use path. Then the route heads past Cresswell Crags and through the Welbeck and Clumber estates. Then it’s off towards the Fledborough viaduct and into Lincoln itself. The route finishes with a cobbled climb up to the cathedral door. One of the great things about this route is that there is a station at both ends which makes the logistics of it a bit easier. It’s also slightly downhill ! Enjoy this route ? Don’t forget to check out our cycling events. The re-invented former railway lines in the Peak are popular with tourists and locals alike. This short route explores a couple of them . Starting at Bakewell station, the route heads off down the traffic free Monsal Trail. Be careful, especially at weekends to watch out for dogs and children off their leads ! The route goes down the route of the former Derby to Manchester line and has some spectacular views, a few tunnels and a viaduct to keep you entertained. Once you’re warmed up and have reached Millers Dale station, a short but brutal climb takes you up towards the hamlet of Priestcliffe. From here it’s across the A6 and onto a combination of sections involving gravel tracks and quiet roads and over to the High Peak trail. We follow this trail for a while passing the former Parsley Hay station which has been converted into a bike hire and food kiosk and head south for a while. From here we head off down a long green lane and off towards Middleton and Youlgreave. Here we head up another off road section and make our way back to Bakewell. 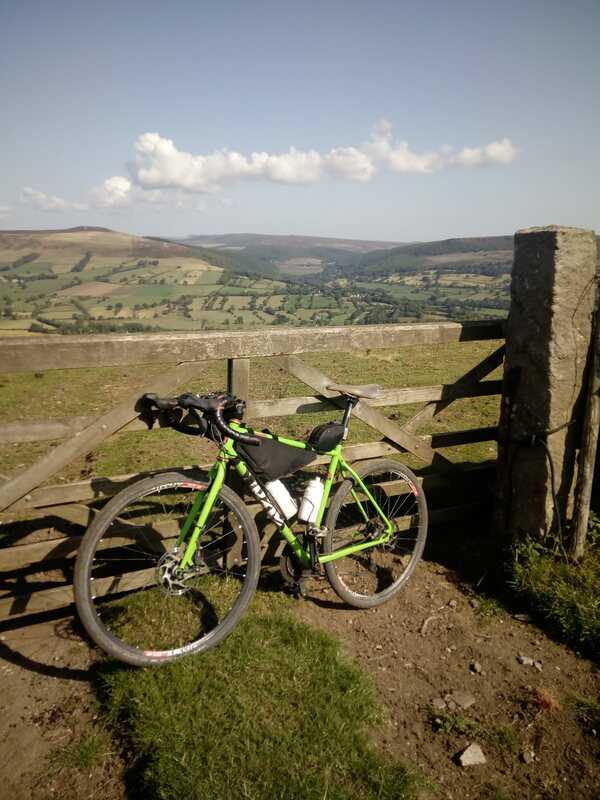 Instead of heading back to the start, there’s a short section along the A6 which takes us onto a bridleway that leads to the beginning of the Monsal trail. If you love this route, don’t forget to check out our events that we are holding throughout the year. In the week when we lost arguably England’s most famous goalkeeper and Sheffield lad, Gordon Banks I thought I’d put up a local route that begins on the edge of the city. Sheffield markets itself quite rightly as the Outdoor City. A big chunk of it is in the Peak District and the national park is easily accessible. This route starts (and finishes) at the Norfolk Arms. A popular watering hole with cyclists. From here it heads across the edge of the Mayfield valley and round the Rivelin Dams. From there there is a punishing climb up to Stanage, which featured in the start of Pride and Prejudice starring Keira Knightly. Another hard climb (this time on road) follows round the bottom of the edge to one of our fave spots in the Peak – the Burbage Valley. Then it’s onto the former country estate of Longshaw. From here you have two choices – cut the bottom of the route off and head off back to the pub or go south for some more exploring. If you choose the latter it’s on to Moss Road, one of the few proper bits of gravel we’ve got in the area. Past the railway tunnel chimney and over Brown Edge over a little used trail. Then it’s across Big Moor and Ramsley Moor and up to Wellington’s Monument for a view down the valley towards Chatsworth (also in Pride and Pedjudice). Then it’s over to Curbar Gap and across the edges back to Longshaw. From here pass through the estate and onto Houndkirk. At the end of Houndkirk (a short distance from the end) there is always the option, if time permits to go and have a play on the MTB trails at Lady Cannings. The Peak District is our back yard and where we do a lot of our riding. It’s one of the UK’s original national parks and has a very diverse landscape. Like many riders of a certain age, for us time and money is at a premium. Whilst we’d love to have the funds and freedom to do epic tours, for the majority of the time we’re limited to a weekend away at the most. One of the great mountain bike rides in the USA , the Greatl Divide Route is the daddy of long distance MTB routes. It also passes through the neigbourhood of our fave bag supplier Oveja Negra. This got us thinking. How about a MTB route that goes from the northern most point to the southern most point in the Peak that could be done over a weekend ? The northern most point of the Peak is on a bridleway just south of Marsden in West Yorkshire. The southern most point is a hedge bottom just of the A52. This didn’t sound to glamorous so we decided the end of Manifold Valley trail nearby was a better finish. Above’s our idea for a suggested route. From a lot of experience riding in the Peak, we reckon the following. It’ll be a big day out in the saddle. Probably best done over a couple of days with an overnight stop around Eyam. You’ll probably need an MTB due to the section over Cut Gate and Hope Cross. The hardest bit is in the first half. It’s probably one for longer days and dry weather. 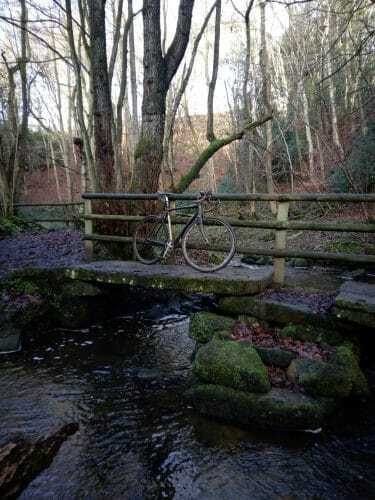 If you did not have an MTB alternatively you could head down the Trans Pennine Trail through Wharncliffe then head towards Bradfield and on to Castleton if you fancied a longer and easier route for a gravel bike.